Accent your outfit and add shine to your cuff with these classic cufflinks! 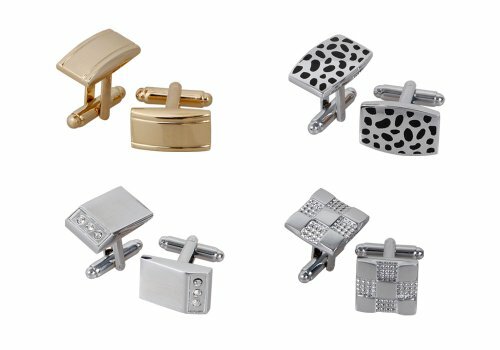 Each set has 4 pairs of assorted styles of cufflinks used to decorate and fasten the cuffs of your outfit. You can use this on collared blouses, dress shirts, or tuxedo shirts. 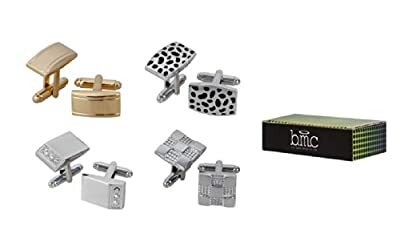 Each cufflink is made of a zinc alloy which will not rust or fade. To apply the cufflinks to your cuff: Cufflinks have a swivel post feature. Designed almost like an earring, the post will penetrate through the appropriate cuff hole and then simply swivel the post, locking in the link to the collar. Each design is roughly: 1-2 cm. Please review selection carefully to see which set you are ordering. NOTE: Due to differences between monitor displays, actual color may vary slightly from image. Bundle Monster is a registered trademark of Remi Collections LLC and is exclusively distributed by Bundle Monster. Bundle Monster trademark is protected by US Trademark Law.